Sarah Rodriguez’s witty personality brings a breath of fresh air to a place every Palo Alto student dreads visiting. 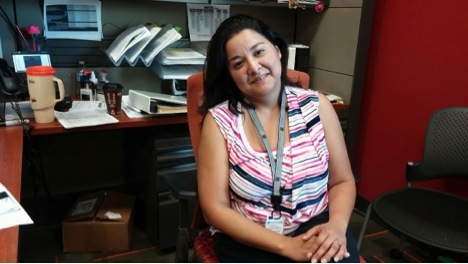 As of July, Rodriguez has been senior adviser in the Admission and Records Office of Palo Alto College, making her career in the Alamo Colleges a total of 17 years. Born and raised in San Antonio, Texas, Rodriguez attended Texas A&M-San Antonio. She received her bachelor’s in Psychology and originally wanted to pursue Nursing. Although the path advised took her elsewhere, she couldn’t be happier with the career she ended up in. Rodriguez explained how the stress of deadlines and chaos of the department does not outweigh the satisfaction of the job. Surrounded by an amazing staff and high spirited atmosphere, Rodriguez said it is not difficult to maintain a positive attitude with this position. Her favorite part of work is one you cannot find in the job description. The fulfillment of helping high-stressed students in crisis find the light at the end of the tunnel and turning what seemed like their last straw at PAC into a simple hurdle that wasn’t very tough to jump. “Fortunate” is the word Rodriguez could not express enough as a definition of her time at the Alamo Colleges. Married for nine years and a mother of one daughter, Rodriguez has received the exposure of a college life beneficial for her child. Grateful for her coworkers, environment and experiences, Rodriguez remains quirky and positively satisfied with her position at PAC.